I’ve had a craving for soft, smooth and squishy comfort food, this week. It must be because we’ve had some drizzly, socked-in, rainy days – what my Dad, with his Glasgow accent, would call a “Gud day fer the hoose” – in other words, a good day to stay indoors and concoct delicious things to eat, to guard against the miserable weather outside. A few years ago, I had the opportunity to try some very unusual (to my taste buds, anyway) delicious, chocolate covered, lemon flavoured marshmallows, procured from a Polish delicatessen in Victoria. They were softer than commercial marshmallows, and the tart lemony flavour of the gooey centre married well with the thin dark chocolate coating, which snapped obligingly when popped into the mouth. I confess I ate almost a whole box, unto myself, and had to slip out to the delicatessen to replenish the stock before this was noticed by my co-workers. 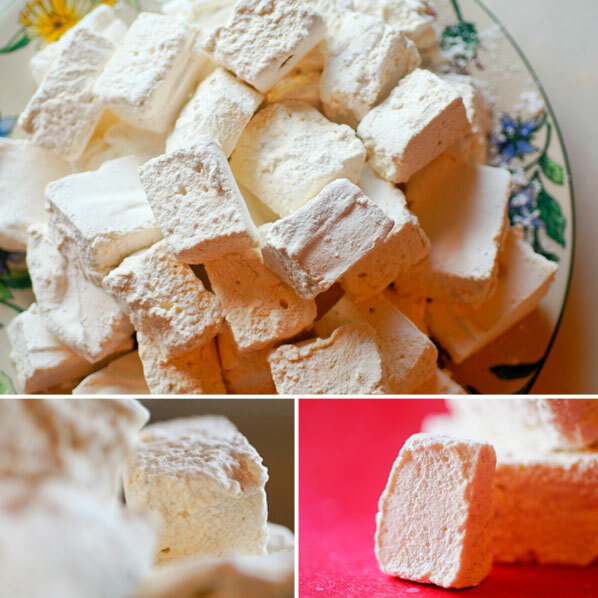 I eventually want to re-create these tasty morsels, but first, I needed to learn how to make the basic vanilla-flavoured mallows my kids adore. My health conscious side was going to make them for the boys, as a more “wholesome” (Hah! Who am I kidding?) or at least better tasting, alternative to the bagged kind, without preservatives, and using real vanilla. 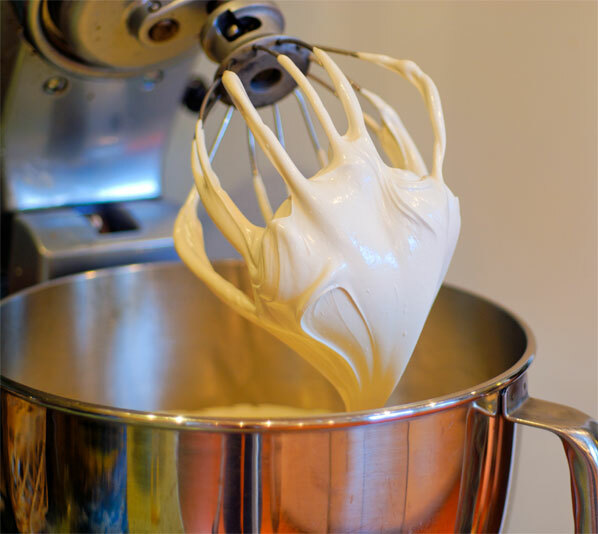 I also wanted to master homemade marshmallow crème, for use in chocolate centres. After scouring the internet for likely recipes, the following sounded interesting, straightforward, and made with simple ingredients. This was really fun and very easy to concoct, as the stand mixer did most of the work. There is no cooking involved, and after the required 12-15 minutes of beating, I had a fluffy white cloud of extremely gooey fluff. Next time, I will perhaps try a lighter corn syrup, or will perhaps try substituting honey for all or part of the syrup, as it is definitely a presiding taste in the final product, but it worked like a charm to produce the required fluffiness. I also liked the fact that this is made without gelatine, and is therefore suitable for ovo-lacto vegetarians. Now. On to the marshmallows. These use unflavoured gelatine, and so would be unsuitable for vegetarians, but I would be very interested in finding an alternative. My partner has suggested agar-agar, which perhaps I will try next time. Once again, the brave stand mixer is called into action. Quite frankly, I don’t know how a person could concoct these treats without one, but perhaps I am just lacking in the patience it would require to stand for 15 minutes with a hand-held mixer. Hmm, clearly this is one of those culinary opportunities which reflect character traits. This recipe does require the use of a candy thermometer, as the sugar, water, corn syrup and salt must be cooked to 240 degrees F, before being combined with the gelatine/water mixture. It also requires you to work very quickly, once the desired 15 minutes of whipping is completed. I scrambled to get the marshmallow in the prepared pan, and was very glad to have a silicon spatula to deal with the sticky mass, as it threatened to adhere to everything. Once it was dusted in cornstarch and icing sugar, however, it really looked wonderful and … marshmallowy! Nothing to do now except leave it to sit uncovered, overnight. As directed in the recipe, I cut the mass into small squares with a pizza wheel, using a small paring knife for the corners. I dusted both implements with cornstarch/icing sugar, but still felt the need to rinse them in hot water frequently. Tossing the squares in the cornstarch/icing sugar, I couldn’t help thinking how much fun this project would be to do with kids. The result was a jiggly, happy pile of squishy squares, with a yielding, soft texture when bitten into, and a lovely fresh taste. I had cut them into generously sized pieces, perfect for the next step of my comfort food weekend. 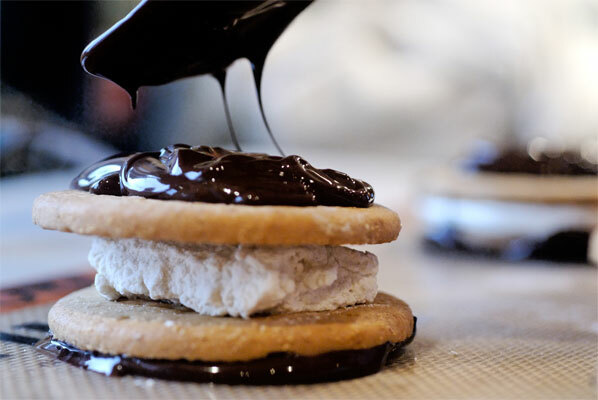 I had an idea for a decadent gourmet S’more composed of: two Digestive biscuits (to replace the Graham Crackers), slivers of Callebaut bittersweet chocolate, and of course, an oversized, homemade marshmallow. And next time I will. Now, with all these wonderful ingredients, I decide to “go big or go home”. I temper the bittersweet chocolate (hey, this is getting more comfortable), coat the bottoms of the cookies, flip them over, put cut marshmallows on half of the batch, and pipe marshmallow crème on the other half. I cover them with another cookie, then smother them in tempered chocolate, which, I am relieved to see, retains its gloss! The verdict: the boys prefer the actual marshmallow to the crème, for its satisfying sponginess, whereas I much prefer the consistency and the smooth, level look and feel which the crème imparts. They definitely taste more like a cookie I remember from childhood, called a Wagon Wheel, only lacking the jam. Okay, I didn’t manage to get that wonderful toasted flavour into the marshmallows, but that’s a good reason to try making them again. 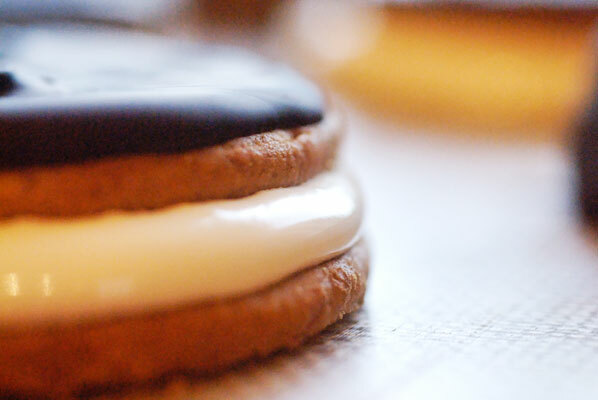 In fact, my friend Sarah suggests using either a heat gun or a crème brulee torch to toast the marshmallow, before topping it with the second cookie, and coating with chocolate. This would require letting the marshmallow return to room temperature before enrobing. With that terrific suggestion, and because I find an excellent recipe for homemade graham crackers, on Emily’s blog: When cooked a little longer than the recommended time – about 12 minutes, instead of 10 – they are crispy and very tasty. I will definitely re-visit this idea. In fact, an idea is forming for a marshmallow crème and homemade graham cracker molded chocolate, perhaps infused with organic strawberry puree – a Wagon Wheel to pop in your mouth. Mmmm. Now, time to flop in a chair with a chocolate cook book, and a steaming mug of dark hot chocolate, topped with a glorious homemade marshmallow.